The Blue Zones, 2nd ed. The Blue Zones, 2nd ed. details 5 populations of people around the world who routinely live to 100, largely disease-free. Author Dan Buettner presents 9 lifestyle behaviors that are common among these 5 populations. • Recommended for: Anyone who wants to prevent chronic health problems as they age! Dan Buettner's bio is as interesting as the Blue Zones concept. He is an explorer, educator, best-selling author, producer, and speaker. He co-produced an Emmy Award-winning documentary and holds 3 Guinness records for endurance cycling. Buettner was born and raised in Minnesota. As a kid, he spent a lot of time camping, hunting, gardening, and bicycling. His parents regularly took him and his brothers on week-long canoe trips. When he got older, Buettner and his brother completed several transcontinental cycling trips: "Americastrek" (15,000 miles from Alaska to the tip of South America), "Sovietrek" (13,000 miles following the 45th parallel around the world), and "Africatrek" (12,000 miles from Tunisia to South Africa). During the Africatrek, Buettner filmed a PBS documentary. In 1995, Buettner formed Earthtreks, Inc. to manage his discovery and educational expeditions. His team carried laptops and a satellite dish so that they could broadcast their treks to 40,000 classrooms. This was an interactive experience with viewers offering ideas and suggestions for what and where to explore, such as solving the mystery of the collapse of the Mayan civilization in the 9th century. While researching the various Blue Zones, Buettner formed Blue Zones, LLC in 2003. This group is now working with several communities to adopt the Blue Zones principles. This endeavor has already demonstrated an improvement in the overall health of these communities, realizing a substantial drop in health care costs as well. In September 2009, Buettner gave a TED Talk titled "How To Live To Be 100+". It has been viewed over 2 million times. Though Buettner is not a physician, or even a health care professional, he set out to understand why people on the island of Okinawa lived to 100, largely disease-free. He approached National Geographic who supported his idea and also received a grant from the National Institute on Aging. At the time that Buettner got interested in longevity, researchers had already identified 3 populations of people around the world who lived much longer than average: Okinawans, Sardinians, and Seventh-Day Adventists, in Loma Linda, California. Buettner's first report of these 3 populations appeared in the November 2005 issue of National Geographic magazine: "The Secrets of Long Life." As research continued, 2 other populations were discovered: one in Costa Rica, and another on the Greek island of Ikaria. 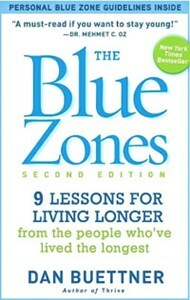 Buettner then published the first edition of The Blue Zones in 2008, followed by this, the 2nd edition, in 2012. 1) Move Naturally: The world's longest-lived people don't pump iron or run marathons. Instead, their environments nudge them into moving without thinking about it. 2) Don't Overeat: The Okinawans say "hara hachi bu" before meals as a reminder to stop eating when they are 80% full. 3) Consume a Plant-Based Diet: The cornerstone of most centenarian diets is beans. They typically eat meat -- mostly pork -- only 5 times per month. 4) Drink Wine: Moderate drinkers outlive non-drinkers, especially if they share those drinks with friends. 5) Have a Sense of Purpose: Knowing your sense of purpose is worth up to 7 years of extra life expectancy. 6) Reduce Stress: Stress leads to chronic inflammation, which is associated with every major age-related disease. The world's longest-lived people have routines that shed stress. 7) Be Spiritual: Attending faith-based services 4 times per month adds up to 14 years of life expectancy. 8) Put Loved Ones First: Centenarians put their families first. They keep aging parents and grandparents nearby, commit to a life partner, and invest in their children. 9) Belong to the Right Tribe: The world's longest lived people chose or were born into social circles that support healthy behaviors. Every once-in-a-while, you read something that completely changes how you think. The Blue Zones did that to me. This book is the most significant health promotion book I have ever read. Beginning in the early 1990's, I embraced the idea that exercise was the key to improving our health. I relegated diet and psychological factors as secondary to the powerful health benefits of exercise. Today, -- mostly as a result of reading this book! -- I no longer regard these 3 lifestyle behaviors (eg., exercise, diet, happiness) in such a lopsided manner. Indeed, each is critically important for our health, especially as we age. The 9 Blue Zones principles listed above fall into 3 general categories: exercise/physical activity (#1), diet (#2-4), and psychological factors (#5-8). The last one, #9, encompasses all 3 categories. Reading this book, combined with reading about the health benefits of a Mediterranean diet, the successes of the Pritikin Institute, my study of other research, listening to speakers at the American College of Lifestyle Medicine, etc., made me change my diet: I have moved ever closer to a plant-based diet, and, I have learned to enjoy red wine more than I used to. • Photos & Illustrations: A variety of black-and-white photos are included. Some of them profile the people discussed in the book. Several illustrations are also provided. All photos and illustrations help to enhance the discussion. • Tables & Graphs: This book contains numerous tables. These summarize key points discussed in the text. • Documentation / Accuracy: This book is based on many years of scientific research. A Bibliography that lists dozens of specific research papers is provided at the end. Complex physiologic concepts are explained in a clear and easy-to-understand way. Buettner attempts to relate the science to lifestyle behaviors, and, vice-versa. Sometimes while reading this book, I felt that it "meandered" a bit too much. This made it seem more like a novel than a scientific/health resource at times. Blue Zones is transforming not only the way we think about maintaining our health as we age, but, also, how medical care is practiced. I feel that The Blue Zones, 2nd ed. is mandatory reading for everyone. While this is a consumer book, all physicians -- especially those in primary care -- should read it as well!